• A “Baby Grand” was straddling between the balcony and the living room – now how often do you see that happening in real life? • The space in front of the main door was “marbled up” - this gave the perception (at least to us) that this space is part of the unit’s area, which in fact it isn’t. • A loft was built within the “double-volume” master bedroom, and we were told at that time that this is an option at owner’s expense after the Certificate of Completion (CSC) for the project is obtained. However, we found out later that such construction, even if we are prepared to pay for it, may not be approved. But in the spirit of unbiased reviewing, we decided to revisit the sales gallery of “THE TRIZON” yesterday. THE TRIZON is a freehold project consisting of 289 apartment units in 3 iconic towers of 24-storey each. It is sited on a 194,000sqft elevated plot - where the former “Himiko Court” used to stand. The entrance to THE TRIZON is located on Ridgewood Close off Mount Sinai Drive. There will also be a side-gate from the development that will lead to the Pandan Valley/ Mount Sinai Drive intersection, from which is a short 3-mins walk to the main Holland Road and about 8-mins walk to Dover MRT Station. The expected TOP of THE TRIZON is end-2014. Orientation-wise, Tower 8 is located directly opposite to Towers 2 & 6, and separated by the lap-pool. Towers 2 & 6 house the larger 3 and 4-bedroom units, while Tower 8 houses mainly the smaller 2 and 3-bedders. All apartment units are N-S facing. There will also be a total of 312 underground carparks within the development. When we first visited THE TRIZON, there were 3 showflats within the sales gallery. This time around, only 2 showflats are open for public viewing. The 4-Bedrooms showflat is currently closed for “improvement works”. This made us wonder if we are not the only ones that have issues with the “representations” of the previous 4-bedders showflat. The first showflat is the 1894sqft, 3-Bedrooms unit ((Type C1a). Access to the unit is via common lifts (no private lifts for this development, sorry!). You get 3.34m high ceiling, marble flooring for the rectangular shaped living/dining area and even the kitchen. However, for a supposed high-end project, the developer can certainly do better than the small 60cm x 30cm marble-slabs that are used for the floors. The balcony is long and rectangular, and takes up almost 250sqft. There is no dry kitchen, which actually works for this unit as you get more space in the living/dining area. The wet kitchen is good-sized, and comes with full set of top & bottom cabinets. You also get “Smeg” brand hob/hood/oven/dishwasher, “Damixa” kitchen sink/faucet and a built-in single-door fridge (quite small). The yard is definitely big enough for laundry chores, but it may be a challenge to fit a regular-size single bed into the home shelter/maid’s room. The two common bedrooms are of decent-size, which you will have no problem putting a queen-sized bed into. The common bathroom (quite big) has homogenous tiles for the floor/walls and comes fitted with “Hansgrohe” bathroom accessories. Now for the master bedroom: this is where the “double-volume” (6.7m) ceiling height comes into play. And this time around, the marketing agent did specify that building a loft here may be possible, but is subjected to approvals from first the MCST and then the BCA, and only after the CSC is obtained. However, there is no guarantee that approvals will be granted. The master bathroom is very elegant, with marble floor/walls, a standing rain-shower and a step-down sunken bath. You also get separate “His/Her” bathroom sinks, which is a nice touch. The other showflat is the 1012sqft, 2-Bedrooms unit (Type A2). You get the same marble floors, a much smaller rectangular-shaped living/dining area, a rectangular balcony/planter area that takes up about 80sqft, a long strip of a kitchen that comes with top/bottom cabinets and similar kitchen accessories minus the fridge and dishwasher. There is no yard in this unit, and the tiny home shelter is situated in the living room itself (less than ideal). The common bedroom can probably manage a queen-sized bed, while the common bathroom is surprisingly large for such a smaller-size apartment. The master bedroom is of decent size, and the funny thing about the master bathroom is that there is a tub but no overhead shower – it comes with one of those retractable hand-held showerhead, which you will have to hold on to as you take your shower. • The quality of furnishing and fittings, which we felt is a close second to Parvis. We especially like the luxurious look of the master bathroom. • All areas (except maybe the home shelter) in both showflats are very regular in shape and highly functional. This is especially important for the smaller units, where space is a premium. 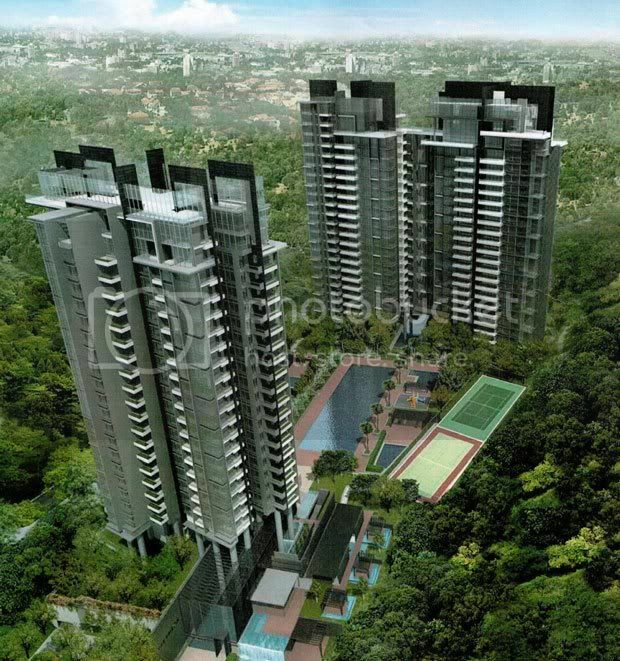 • The location – THE TRIZON is easily accessible from either Mount Sinai Drive or from Pandan Valley. It is also located very close to amenities like Jelita Shopping Centre, Ghim Moh wet market/food centre, Clementi Central Hub & Holland Village, and within walking distance to Dover Road MRT Station. • The Mount Sinai area is one of the most popular Expat address. So one can expect good rental yields. • The 1894sqft 3-bedder unit is actually much smaller than it sounds. If you minus the 250sqft of balcony space and the 118sqft of void area in the master bedroom (* remember the “double-volume” ceiling? ), you are left with an “interior” area of about 1526sqft. • Only one primary school is located within 1-km of THE TRIZON – Henry Park Primary. The only consolation is that the school is co-ed, and if the past three years are anything to go by, no balloting for phase 2C! The sales gallery for THE TRIZON has been up for about 3 months now. However, the project is supposedly still on private preview basis, with the main launch only happening after the Chinese New Year. At present, only units in Towers 6 & 8 are released for sale. We were told that almost 80% of the 180 units released so far have already been sold – only 7 units of the 2-bedders and 10 units of the 3-bedders remain. For those who are really interested in THE TRIZON, you may be interested to know that the project is currently already at its 50% progressive payment stage. On a parting note, the wife and I were really glad that we decided to visit THE TRIZON again yesterday, as our opinion of the project has definitely taken a change for the better. It will probably go into our “To Consider” list now, if we are shopping for a new apartment and have about $2.5 million to spare. But we will probably give units that have "double volume" ceilings a miss. It will also be interesting to see if substantial alterations are made to the 4-Bedroom showflat once they are done “renovating” it. 6 comments to ''THE TRIZON (Review)"
Fantastic blog. I've been following your posts for close to a year. And it really saves me alot of time deciding which show flats to visit. Anyway, just to say a big thank you to this post. I went to the showflat and have bought a unit at The Trizon. Bought a 2+1 1346 sq ft unit there. Took your advice on the double volume ceiling. Gave the double volume one a miss. Just to add, this unit layout is the only "smaller" unit situated in the more luxurious blocks 2 and 6, which has a ceiling of 3.35m compared to the other smaller units in the development which are all situated in block 8 with ceiling height of 3m only. I think that's the plight of many sandwiched Singaporeans. Can buy but the opportunity costs and perhaps real costs to stay is high (but i think Drs have no problem?). Having said that, since property prices are at all time high, will it be easy to dispose it? Keep profits and buy another when prices soften? Haven't heard from you in awhile and congratulations on the TOP of your new apartment @The Trizon! In case yours is one of those "double-volume" units, do ensure that you seek the necessary MCST/BCA approval before building that loft in the master bedroom. I am still waiting for letter of notice for key collection for Trizon. Check with you, how is the workmanship and defect? Do you know what is the rental potential eg. $/psf? I am not sure the pptyguru advert are accurate. Thanks for you well wishes. The double volume units are too rich for a lowly healthcare professional like me. I remain unfortunately in the forever squeezed middle class, but in any case the reminder is timely for other richer owners of the Trizon. The workmanship is reasonable, not too many defects, mostly minor. I'm surprised you have not received your keys yet. If you look at comparison, I think looking at Marbella and Montview would be a reasonable gauge and most of them are also asking around the high 4's to low 5's. I'm looking at around $5 psf which I feel is reasonable.